5438 30III 5 Mk. 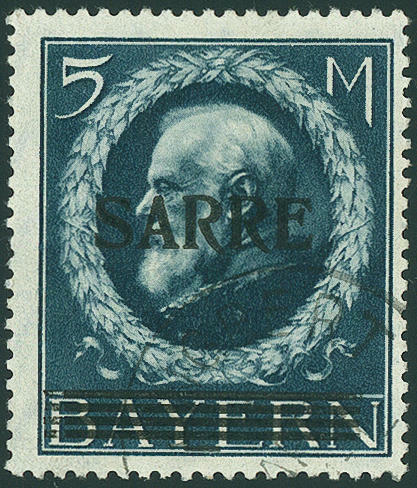 Bavaria Sarre with rare overprint variety \"fatter control check mark\", which only on field 12 occurs, fresh colors and very well perforated, in perfect condition unused with clean small hinge. Photo expertize \"excellent fresh condition\" Burger BPP. Michel 2000,- €. 5439 ⊙ 30III 5 Mk. 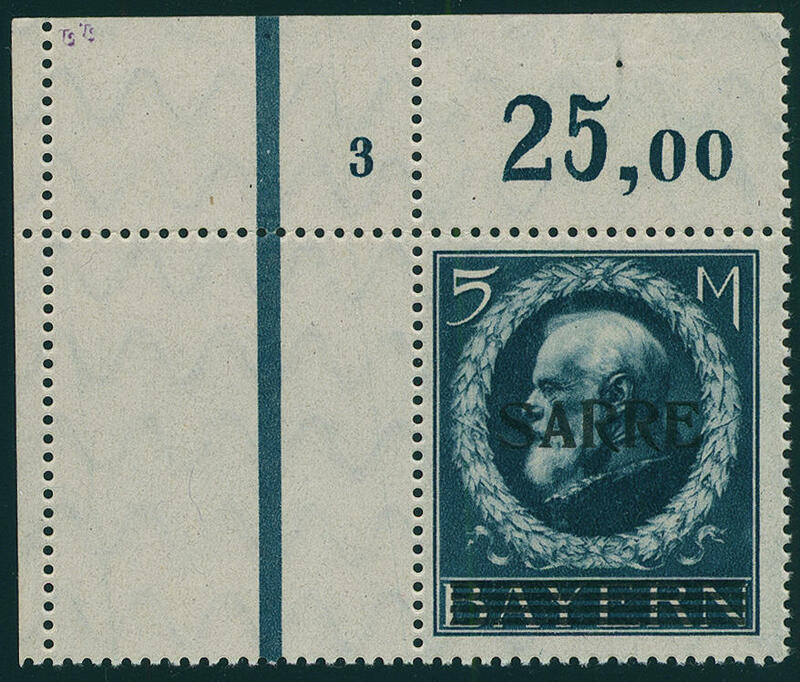 Bavaria Sarre with overprint plate flaw \"fatter control check mark\", fresh colors and in perfect condition, neat cancelled \"ST. INGBERT 1. MRZ. 20\", photo expertize brown BPP. Michel 3000,- €. 5440 30L 5 Mk. 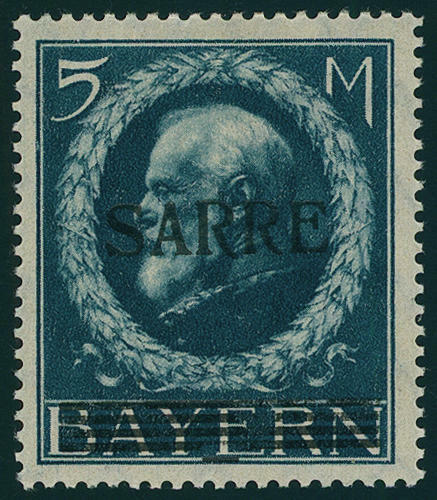 Bavaria Sarre from the left lower corner of the sheet with left attaching four sides perforated blank field, fresh colors, unfolded and in perfect condition mint never hinged an outstanding quality this Saar rarity for the highest standards! Photo expertize \"perfectly mint never hinged condition\" Burger BPP. 5441 30LPl.Nr. 5 Mk. 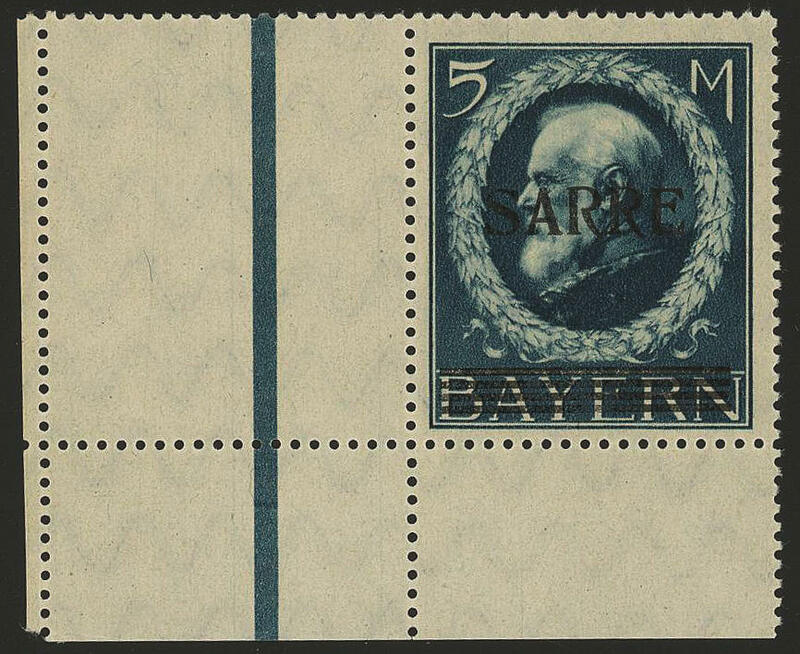 Bavaria Sarre, left upper corner of the sheet with plate number \"3\" and attached blank field as a result of of a sheets miscut, fresh colors and very well perforated, in perfect condition mint never hinged there are only few corners of the sheet in this kind have become known. A Honor for the advanced special collection! Photo expertize \"the quality is perfect\" brown BPP. 5442 ⊙ 31 10 Mk. Bavaria Sarre, fresh colors and very well perforated, neat cancelled \"ERBACH-REISKIRCHEN\", expertized Burger BPP with inspection result. Michel 320,- €. 5443 ∆ 31Pl.Nr. 10 Mk. 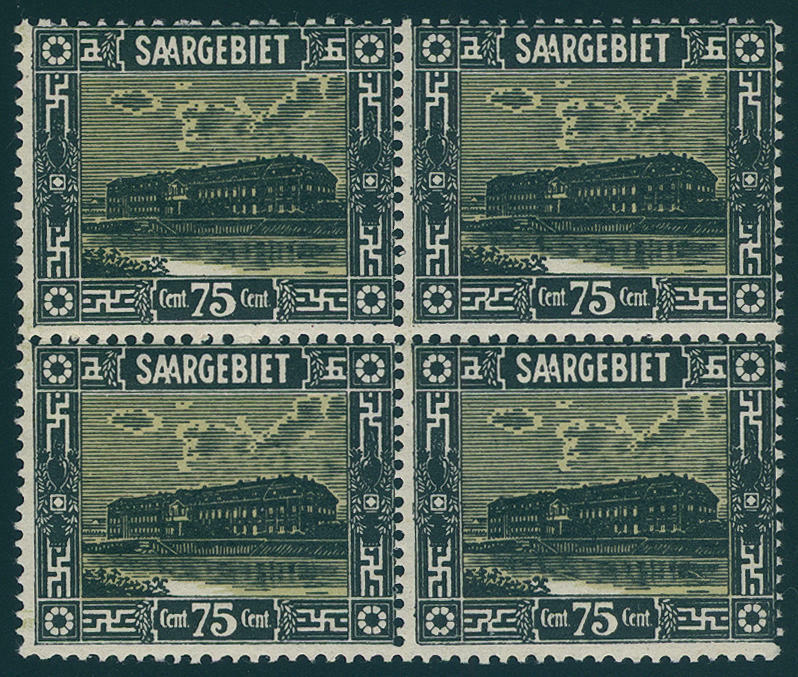 Bavaria Sarre, gorgeous block of four fresh colors and very well perforated from the left upper corner with plate number \"3\" on magnificent letter piece, neat cancelled \"ST. INGBERT 4. June 20\". A very decorative and especially associated with the plate number extraordinarily scarce unit! Photo expertize \"perfect quality\" Ney BPP. 5444 ✉ A/C31 2 Pfg., 3 Pfg. And 7 ½ Pfg. 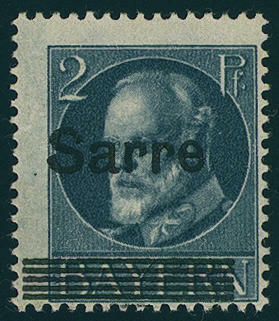 (pair) Bavaria Sarre, the three not issued values, wonderful fresh colors and in perfect condition with Bavaria 30 Pfg. On correctly franked, not transported gef. 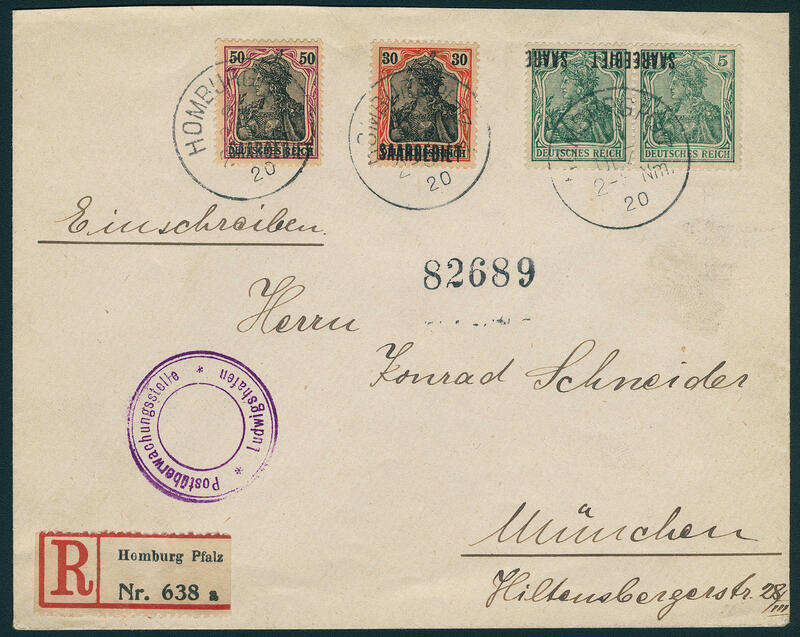 Registered cover with clear single circle postmark \"ROHRBACH B. ST. INGBERT 11. April 20\". 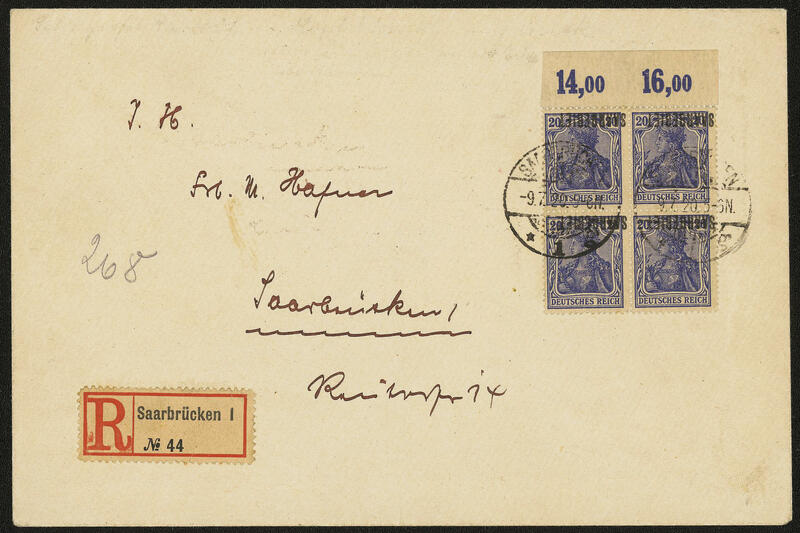 From this covers are only a few examples have been preserved, the to the rarities the old Saar philately count! Photo expertize Burger BPP. 5445 A31 2 Pfg. 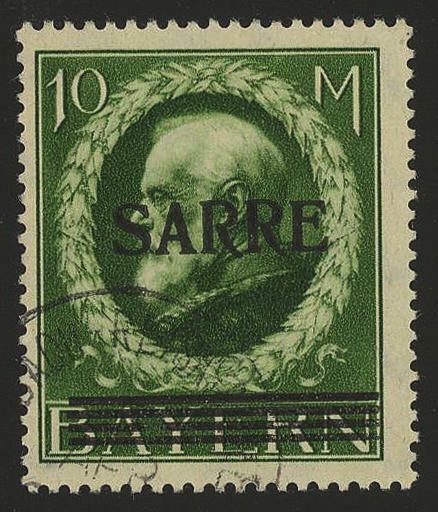 Bavaria Sarre, the scarce not issued stamp, wonderful fresh colors and very well perforated, in perfect condition mint never hinged the edition amounted to be on only 1000 examples! Photo expertize \"perfectly mint never hinged condition\" Burger BPP. 5446 ∆ A31PFBI 2 Pfg. 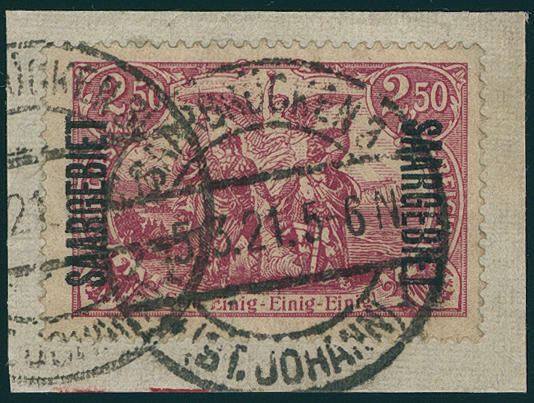 Bavaria Sarre, the very scarce not issued value with overprint plate flaw \"uppermost grid line right shortened\", fresh colors and in perfect condition on very nice white letter piece with clear single circle postmark \"ROHRBACH B. ST. INGBERT 11. April 20. \", removed for quality control. 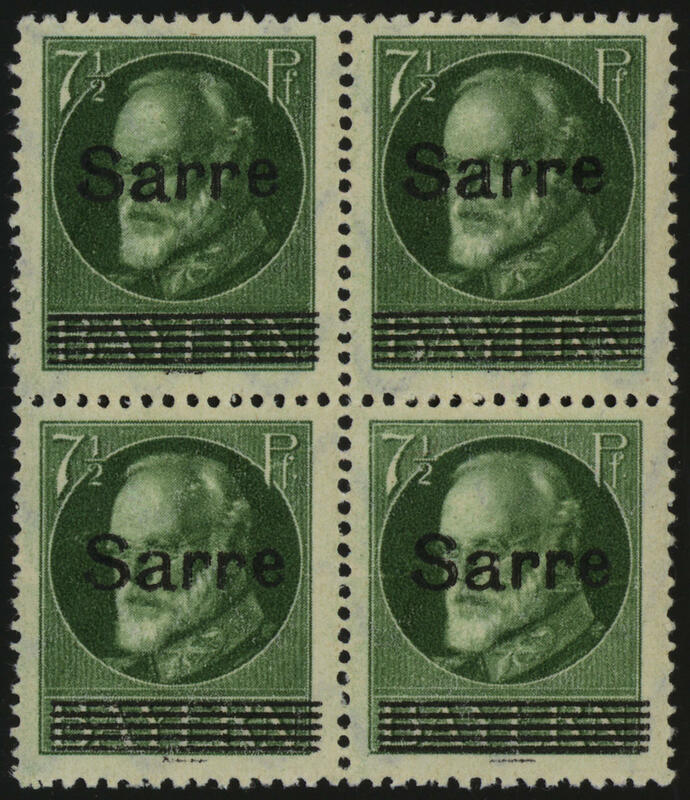 A significant old Saar rarity with an edition from only 10 pieces! Photo certificates Roumet, Burger BPP and new photo expertize \"the quality is perfect\" brown BPP. Michel 9000,- €. 5447 B/C31 3 Pfg., 7 ½ Pfg. 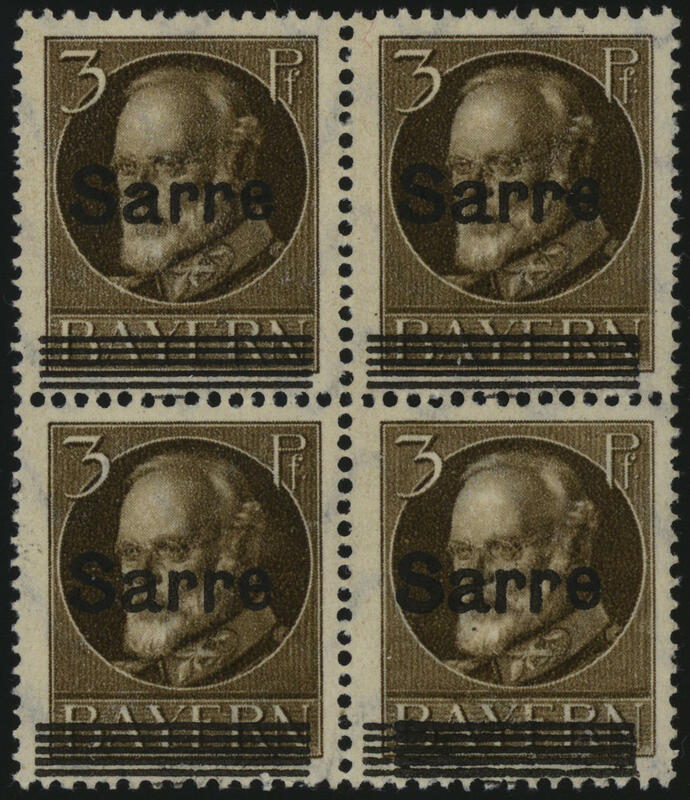 Bavaria Sarre, not issued values in blocks of four, fresh colors and very well perforated, in perfect condition mint never hinged as well two values the 3 Pfg. With plate flaw \"e right closed\" (Michel no. B31 HI). Photo expertize Burger BPP. Michel 2200,- €. 5448 ✉ C31 7 ½ Pfg. 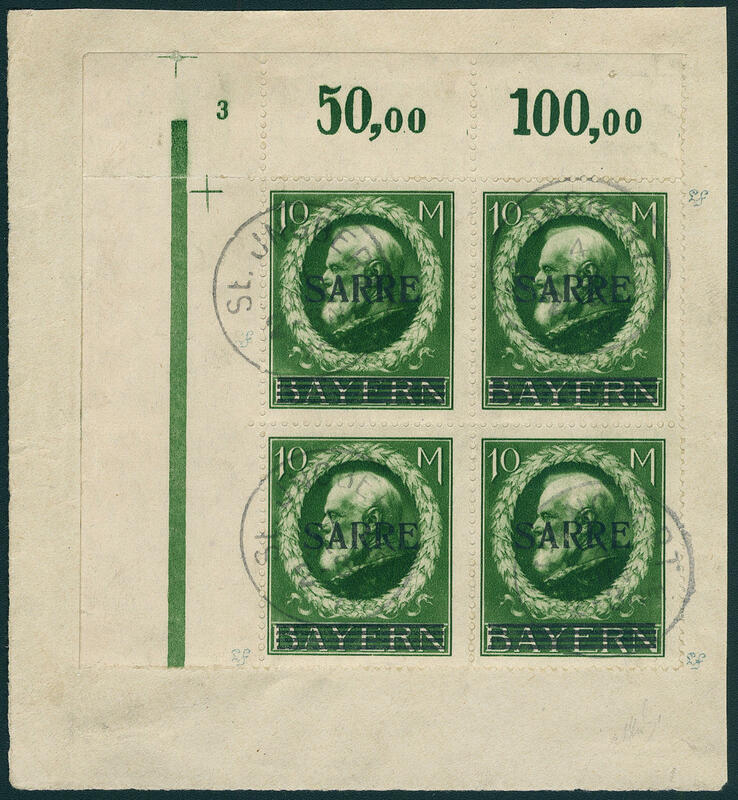 Bavaria Sarre, faultless block of four with additional franking on under-franked registered covers, unopposed transported with single circle postmark \"HOMBURG 8. May. 20. 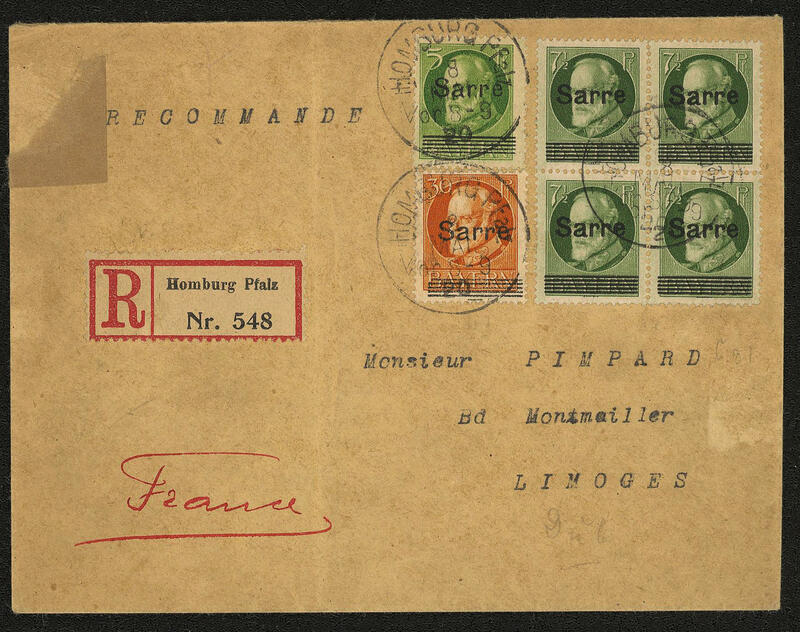 \" to Limogs / France with arrival postmark. An extraordinarily scarce franking! Photo expertize Burger BPP. 5449 ✉ 32K 5 Pfg. 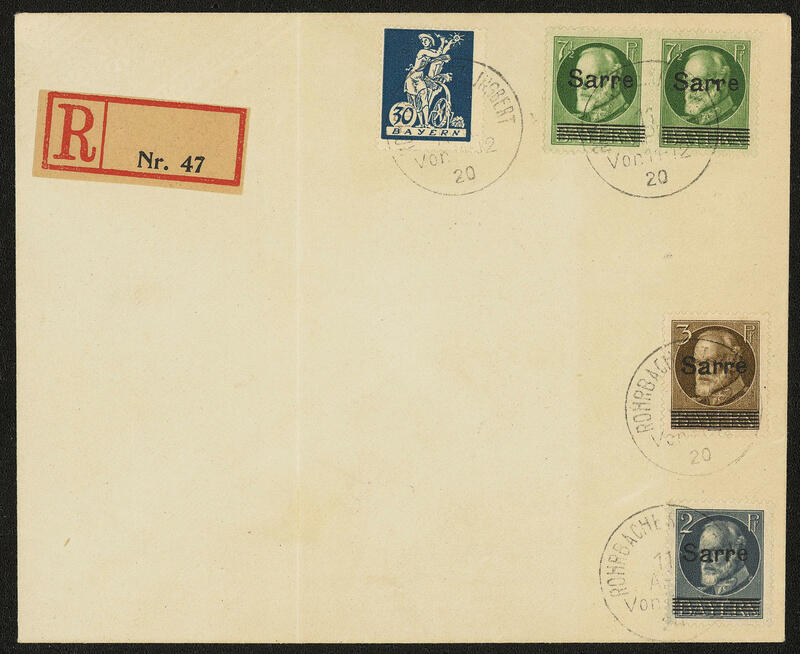 Saar region on Germania, horizontal pair with inverted and shifted overprint and additional franking on very nice correctly franked registered cover from \"HOMBURG 20. 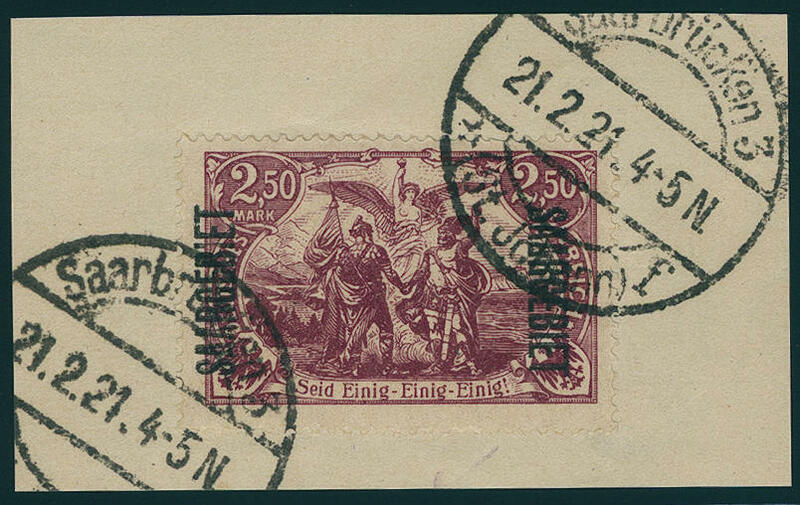 December 20\" with additional violet censorship stamp \"post monitoring place LUDWIGSHAFEN\" to Munich with arrival postmark. An especially nice cover of this variety! 5450 ✉ 35K 20 Pfg. 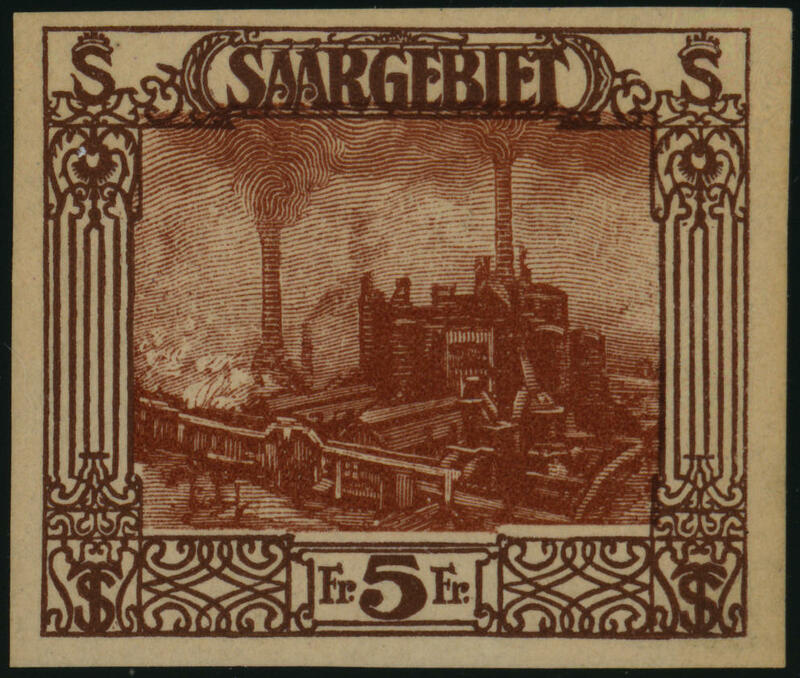 Germania with inverted overprint \"Saar region\" block of four from upper margin (plate printing), in perfect condition on very nice, under-franked registered local letter from \"SAARBRÜCKEN 9.7.20. \" with arrival postmark. Already lots used is these variety extremely rare and becomes by Michel catalogue only noted without price. 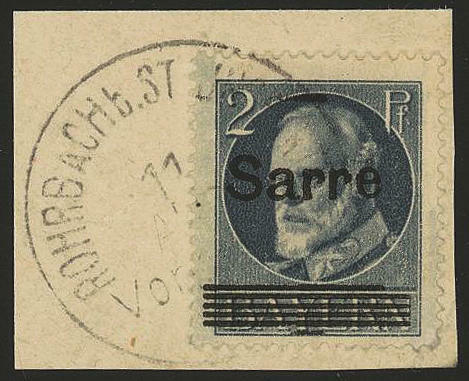 This is the only known block of four and as cover a significant rarity the Saar philately! Photo expertize Burger BPP. 5451 ∆ 43a,d 2, 50 Mk. Rose lilac and dark brow purple, fresh colors and in perfect condition on very nice white letter piece, expertized Burger BPP. Michel 140,- €. 5452 ∆ 43c 2, 50 Mk. 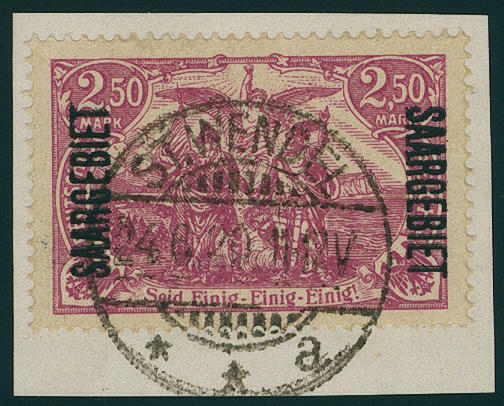 Red lilac, about pressure plate II, in perfect condition on piece with two ring cancel \"SAARBRÜCKEN 15.3.21. \". A very scarce, nearly always missing colour! Photo expertize \"perfect quality\" Burger BPP. 5453 ∆ 43cIII 2, 50 Mk. 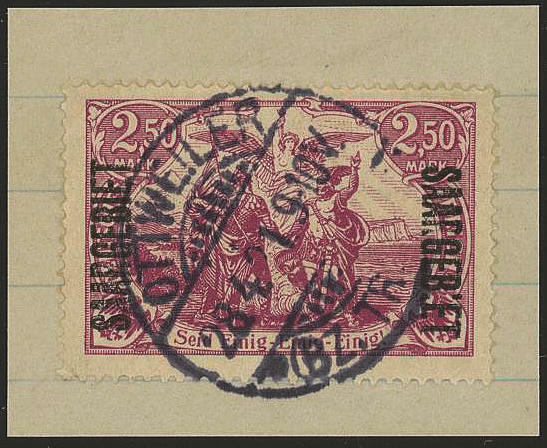 Dark gray purple, the scarce colour with additional variety \"mutilated I in the Saar region right\", fresh colors and in perfect condition on very nice letter piece, centric and neat cancelled \"OTTWEILER 28.4.21. \". An outstanding quality for the highest standards! Photo expertize Ney BPP. 5454 / 84/97U Landscapes 1922, the complete set four sides unperforated, 10 C. And 30 C. Unused, otherwise in perfect condition mint never hinged, very scarce, wonderful having bright colors set. 5455 ✉ 85,99 5 C. And 20 C. On very nice incoming line first flight letter from \"SAARBRÜCKEN 20.5.27\" with additional franking USA 10 C. Airmail from \"skirt SPRINGS 1. 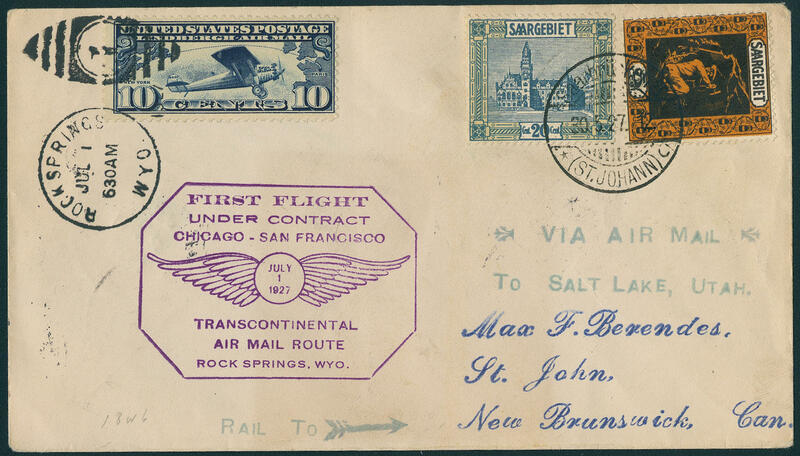 July 27\" with violet First Day Flight Cancel \"FIRST FLIGHT UNDER CONTRACT CHICAGO SAN FRANCISCO TRANSCONTINENTAL AIRMAIL ROUTE ROCK SPRINGS\" to Canada with all transit stamp front- and reverse. Such incoming lines with Saar frankings are extremely rare! 5456 101 75 C. Blackish gray green / matt reddish yellow block of four, fresh colors and in perfect condition mint never hinged Michel 380,- €. 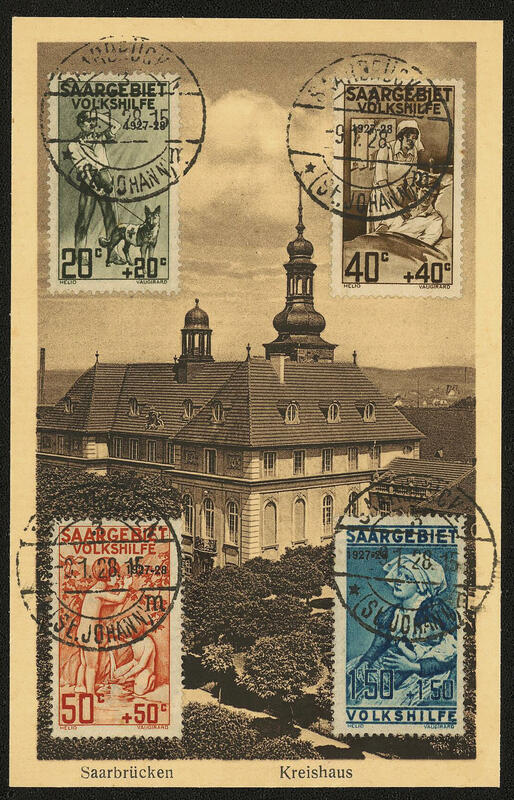 5457 ✉ 104/07 Welfare 1927 complete on face on picture postcard \"SAARBRÜCKEN district house\", all values perfect used \"SAARBRÜCKEN ST. JOHANN 9.1.28. \". Included are same three scarce plate flaw (Michel no. 122 III, 123 II and 124 II). In this kind an unique and extraordinarily decorative card! Photo expertize \"the quality is perfect\" Geigle BPP.